Laying sod is the fastest way to produce an attractive lawn. Check out this quick video for some useful diy tips. Laying sod, whether for a new lawn or for a lawn you are renovating, requires careful attention to proper handling and installation. 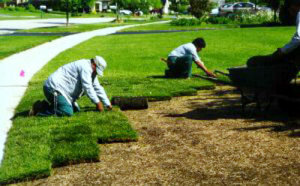 Sod comes in rolls or in large square or rectangular sections that must be cut to size to cover all areas of the lawn. Sod should be installed immediately after it arrives, so ensure that the preparatory work is done ahead of the delivery. Use a rototiller or spade the desired area to a depth of 6 inches. Remove all debris from the tilled area including rocks, wood and roots. Then, level the area with a rake. The soil should be 1 inch below driveways, sidewalks and sprinklers. Then, use a lawn roller to press the soil to a level surface. Fill in any low areas and roller the area once again. You should irrigate the soil in advance of laying the sod. Apply an herbicide product to eliminate weeds 10 to 14 days before you intend to install the sod. You should also pre-fertilize the soil with 1 pound of 6-20-20 fertilizer for each 100 square feet of prepared area. If you need a sod installation expert to help you in the DFW area, please call us today for a free estimate. I am going to share this post with my sister. She will definitely need to read through this. She and her husband are having a new home built and she is up in the air between seeding & laying sod. I know you say that it’s more cost effective to seed, but how large of an area do you think it would be most beneficial to sod? Her property is less than 1 acre in total. Good advice. Spring is just around the corner, and this on my long list of outdoor chores to get my yard ready for Spring. Thanks for the helpful tips. Our school needed a new playground for the football team to practice. The bare ground was causing a lot of scraped knees. I’ll definitely recommend this process so the job gets done as soon as possible and we have a lush green ground soon. This article was really interesting, and I’m glad you said that you should water the lawn to a depth of at least 8 inches. However, I’m so nervous that if I lay the sod myself, I’ll ruin the yard of my new home, especially since I think I’m going to sell in 5 years. I think I’d prefer to hire a professional lawn installation service instead of trying to do it myself. I like that you mention how it’s important to complete preparatory work before you receive your sod delivery so that you can immediately install it. In order to do this, you’d probably want to figure out how long it will take to complete the preparatory work and then start researching the different sod delivery services. This could help you find a service that fits with your schedule so that you can have everything ready.